You are here: Home » Happy Birthday WorldWideWeb. 25 years young. March 12, 1989 is a date that should be celebrated by any world wide web user. This is when a scientist at CERN presented a paper describing a new method of passing and displaying information to other users on the CERN computer system. There were already systems out there at the time that did this. The most famous were, probably, VERONICA or GOPHER. The one that I used around that time was on the VAX mainframe at polytechnic called VAX-NOTES, a great way of passing information around via a bulletin board type layout. These are still remembered by the people who used them all, sometimes fondly but most of the time with frustration as even the biggest of organisations were connecting to The Internet at a fraction of the speed that are in most homes today. The first “node” of this new system was a NeXT computer. 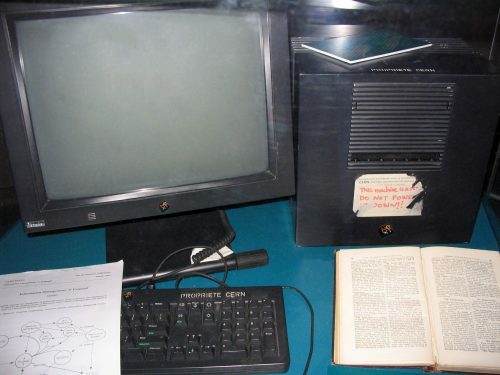 The computer that Steve Jobs sold after he was sacked by Apple. This computer was, in part, chosen by chance. It was bought by Mike Sendall for evaluation and given to Tim Berners-Lee. The rest, they say, is history. The coding of the first web browser for the WorldWideWeb project was made easier because of the way you developed on the NeXT system. Last year saw another anniversary of the web. It was the 20th anniversary of CERN officially putting the World Wide Web into the public domain. Possibly the best thing that happened into making this simple system so engrained into the human consciousness. Look around you when you’re next on public transport. See how many people are staring at their mini computers, sorry, their phone. You’re more or less guaranteed to be correct if you think they are on the World Wide Web. Be that updating Facebook, adding something to twitter even playing candy farmville birds – or whatever the current “must play” game is. After releasing the specification to the world, as well as Tim going around conferences drumming up interest in this new way of communicating around the world by using the internet as a carrier. Getting universities involved was a great way of getting some of the issues that he didn’t have the time to do. Converting the code to run on a different operating system. Writing the code so you could become another “node” in this new system – the server. This system stayed in academia for an couple of years until a new phenomenon happened. The birth of the Internet Cafe. This lasted for most of the first decade of the World Wide Web’s life before disappearing and making a comeback after a couple of years away as a cafe with WiFi access. Normally free but sometimes it is still charged. I, as all as a number of people I know, wouldn’t have had the career that I have had for the last 17 years! As a web programmer, I have seen the rise , and fall, of technologies. From using perl at the start to make dynamic websites to today and the use of PHP. The rise of Amazon and the fall of boo.com. The rise of Facebook and the fall of MySpace. The Internet Bubble and when it popped. Millions of dollars pumped into internet start-ups that had no chance of succeeding in the long term. That list is quite large. Without that paper written a quarter of a century ago, and then CERN’s willingness to give away all of its rights to the technology, you wouldn’t be reading this. Tim’s tweet from his NeXT at the 2012 Olympic opening ceremony.